The winter training season is almost upon us and with this in mind there are a few things to announce for the coming months. The beady eyed amongst you will have noticed that the Norton 5 (our final road counter) isn’t going ahead now. We have scratched our heads trying to find an alternative but there doesn’t seem to be anything else suitable around this time. Therefore it’s been decided to have the 2nd borders league in Chester as the final road counter. More details will be announced nearer the time but the idea is to get as many green vests to the borders as possible and we hope this will encourage more members to take part. The date doesn’t change as this borders league race is also on the 6th November. A new and improved (also a lot safer) course will see the 10k time trial on the Greenway at Mickle Trafford. The first one is on Wednesday 5th October so put this date in your diaries. It’s more of a recce for this first one but please all come along, Jackie has checked with the owner’s of Meadow Lea Farm Coffee Shop and parking is fine on this date so we can car share from the club. The course couldn’t be simpler, just an out and back route, the turn around point is close to Total Fitness, a sign will be there. Head torches and high viz vests are essential on this course as there is no lighting so please bring these along with you. If we can all meet at the club at the usual 6.30pm and travel down to the Greenway from there following Joe’s club talk. It will soon be time for winter runs so please dig out your GreenArmy high viz vests and bring a head torch for some of the runs. I think for the first few runs we decide what run to do on the night depending on the numbers and what the local conditions are like. The important thing is we split into similar paced groups and look out for each other, especially the newer runners who may not know the routes. It is also important we all do the same route on the night, this is in part down to safety, if a runner is struggling with the pace of their chosen group an option will be to drop down a group and they won’t be on their own if all groups are on the same route. As we have found in the past it’s difficult allocating leaders each week and can tend to over complicate things but with the runners we have who know the routes it all generally seems to work out ok on the night without being too prescriptive – but we do need to look after each other! Other options will be available over the weeks and months, Paul Frodsham’s “Fartlek” runs were very popular last year so I’m sure we will add these in again as they were brilliant training and inclusive of all abilities as were the “eye balls out” training runs. For those who have entered the London Marathon but don’t get in through the ballot (folks should hear mid October), the club should hopefully be given 2 places (to be confirmed mid Nov). Those with rejection slips can be entered in the draw for these places BUT please be reminded that there is a further club requirement that you must have completed at least two (and preferably more!) Border League races in the preceding 12 months. A reminder as this seasons first two Border League races will count so there’s a great opportunity to qualify for a place if you have not already done so!! That’s all for now, any questions or queries please get in touch with any of the committee. Looking forward to the winter running season! Helsby RC News from 19th to 25th September 2016. Hello everyone. Thanks to those of you who have already sent race reports in. If anybody has any more updates from the past week then still please send to helsby-race-reports@outlook.com and we can update the blog with them. The third and penultimate race of the Summer Multi-Terrain League took place at Harrison Drive on Tuesday night. I haven’t seen a race report but I can see, from a scanning of the results and current standings, that Helsby were well represented on Tuesday. Current team standings have Helsby Men in 7th place and Helsby Ladies in 21st place. More notable though, are the individual results and standings. Colin Thompson finished 5th overall on the night and 1st in his age category! Helen Owens was the first lady finisher for Helsby, closely followed by Debbie Reid who is currently placed 2nd in her age category for the series. Colin Thompson stays at the top of his age category as we go into the final race next Tuesday and Adam Gordon is presently 3rd in his age category. Overall, some excellent performances by Helsby. Well done everyone and hopefully we will have another great turn-out at Arrowe Park on Tuesday 27th September for the final race of the series. Helsby leads the pack at Macclesfield. “The Macclesfield half on Sunday was an excellent race – a small scale running event organised by runners for runners and as such it is an event which clubs like ours should be actively supporting. 563 runners took part in the half and over 200 in the 5k event held while we were out on the course. Starting on the running track, which was possibly the only flat part of the entire route, the course is challenging (950ft climb) but a real pleasure to run. Most of the route was through the outlying “desirable” villages home to various premiership footballers and the tree lined country lanes offered a real feel of autumn with the leaves changing colour, but also offered welcome shelter from the rain which unfortunately hit us that day – ranging from drizzle to torrential downpours. The course is famous for its 2 big climbs – not especially steep hills, more long slow grinds. From a runners perspective that makes it very difficult to pace yourself on the course as the constantly undulating roads hit your rhythm and left your Garmin stats all over the place. So it was a case of plod up the hills and try to take advantage of gravity on the other side. The support on the course was superb even in the remotest points – the locals seem to have really embraced the race which has been going for 15 years. Knowing that it wasn’t a PB course I went out with the mindset to enjoy the race and scenery – high fiving the kids and thanking the marshalls. It was only when I got to mile 9 and I was told I was 20th that I kicked on for the finish. The long climb from mile 10 to 12 was tough but the encouragement from the locals despite the bad weather was brilliant. For the finish you were back on the track – a really nice touch as there were lots of spectators and people who had taken part in the 5k race, and full commentary on the finish was provided over the speaker system. A great value for money race and really enjoyable event. Well organised from start to finish and a really good atmosphere. 4 Helsby runners – and special congratulations to Richard Hankins for getting a half marathon PB on a really tough course – 1:32 despite the climbs. “Just a few words on yesterdays penultimate club road counter. Despite being a well established club organised Cheshire race I have not done the Macclesfield Half Marathon before. A tough treat was in store! A well organised race by Macclesfield Harriers, who use it to raise all monies for their 3 nominated charities, local hospice, autism and the Rossendale Trust who house adults with learning and physical disabilities in local apartments and houses, some of whom clapped and cheered us along the way as we ran through the outskirts of town, a really humbling experience . It’s described as a challenging and rewarding route through the leafy back roads of East Cheshire. Apart from the laps around the very posh running track at the start it was most definitely undulating. The biggest hill being Hare Hill, a name causing much amusement as I ran up feeling like a tortoise. However Neil. Richard and Dave must have sprinted it like Hares to record the times they did! The finish was back onto the running track, but surprise surprise it’s located in a fairly elevated position at the back of the sports centre, so there was even a sting in the tail at the very end before the 100m sprint to the finish on the bouncy track. Sunshine and showers prevailed; the overnight heavy rain stopped and the sunshine came out just in time for the start, giving cool fresh ideal running conditions, two very short sharp downpours during the race tested us out but then the sun shone for the finish. “An invite to a friend’s birthday party gave me the chance to run the Windsor Half Marathon. This year being the 34th race with sunny and warm conditions. I really wanted to do this race because I lived around this area as a child and it thought it would be a bit nostalgic. Mind you, moderation was called for on the alcohol consumption stakes, for a sporting chance to make it to the start line! The race is set within the 5,000 acre estate of Windsor Great Park in Berkshire. The location is absolutely stunning with fantastic views of an undulating and varied country landscape. It has sweeping deer lawns, small woods, coverts and lots of huge old oak trees. Yes you could actually see the Deer. You also get a good view of the planes taking off from Heathrow 6 miles away! The course is totally car, bike and pedestrian free! But the course is very undulating. Basically two different loops with a small section repeated. My friends had warned me this isn’t a PB course. Hardly any of it level, you either go up or go down. The race starts and finishes on the Long Walk, the wide tree lined avenue which links Windsor Castle at one end with the dramatic statue (known as the Copper Horse) which is George III on his horse at the top of the hill. The race starts off uphill towards the Copper Horse for the first mile. Then you head along the well maintained wide park road way towards The Royal Lodge, now the official residence of Prince Andrew. Then you head towards the quaint Royal School, where some members of the Royal Family have been educated. Then back to the Copper Horse repeating part of the first loop, before heading down on a longer loop towards Cumberland Lodge, Smith’s Lawn and the Prince Consort Statue. Smith’s Lawn is where the famous Guards Polo club is. Now Polo is not a game for the faint hearted. Sitting on a galloping horse swinging a mallet with a long handle, trying to hit a small wooden ball without clouting your horses legs or the other players! But today there is no Polo on. Suddenly I’m transported back to my 11 year old self, remembering running with the family dog, over Smiths Lawn! Then the course drops down to the Valley Gardens and Virginia Water Lake, passing a sign saying no public access. This bit the public cannot normally access. Then a steepish climb away from the water, past one of the farms within the park up to Dukes Lane and Sandpit Gate. The best bit of the race was the final mile from the Copper Horse back to the finish! All downhill, which made for a super quick fast finish! I would recommend this race, for the unusual stunning park location, for the views, the best maintained tarmac roads I’ve ever raced on. Good crowd support. Not the flattest of courses with 630 feet of climb, (similar to Conwy half) Not the cheapest entry fees, but I suspect the Crown Estate take a fair chunk of that. Just a medal, water bottle, Mars Bar and a nut bar from Meridian the sponsors at the end. Well done Geoff, and thanks for sending in the report. We had 8 Helsby members participating across 4 different Parkruns on Saturday. Consolidated club results can be viewed HERE. Colin Bishop finished 2nd place in his first run at Ellesmere Port – well done Colin, and hopefully well be seeing you at number 1 there soon. At the time of writing, Gaz O’Conner is still going strong (so it appears on his tracker) on the epic Offa’s Dyke Race. With just 185 miles over 4 days, from Chepstow to Prestatyn, I’m sure Gaz will be checking his cellphone for this bulletin- so best of luck in the final stages Gaz, and I’m looking forward to hearing about it in the blog next week. Entries for the ESSAR 4 Villages Half Marathon open this Saturday 1st October. As usual, we need as many volunteers as possible to continue making this event successful. So any club members who are entering the race do please try and bring a friend or family member who can help out on the day. Remember to stay safe and start wearing those high visibility vests as the nights draw in. Park Run – I said to CBH after seeing his 15,000 ft of elevation over the weekend (race report below), that my 22 ft of elevation in Widnes made me feel super human and he should check it out on Strava. Getting beaten by a 14 year old last week and pipped in the final straight last Saturday, may just push me over the edge. 1st place still eludes me, maybe I should knock the Friday night bevy’s on the head and give it a real good go, after all it’s a proper serious race after all. Right enough about me and onto the good stuff. Ian Rutherford took time out from social media to send over a report, thanks chief. King John’s Castle Fell Race – Saturday 17th September. The Raven Inn in the small but beautiful village of Llanarmon-yn-lal at 11am was the start of this Clwydian hill race where five members of the Greenarmy hit the start-line. A small but competitive field assembled and started by race organiser Jon Linley who interestingly said that next year will be the last time he will organise the race and is pleading for someone to take this on; be such a shame to see this disappear from the calendar. Within the first half mile is the quick scramble over the ruins of King John’s Castle which is nothing more than a large mound and the race then begins proper. A great route of trail, open fell, hill running continues with many styles, gates and fences to contend with. As ever the Joe and Mario support crops up in a couple of places around the course; towards the end I could hear in the distance the vocal encouragement each of them was offering to Neil who ran an excellent race finishing a very comfortable 2nd – great running again from the man in such wonderful form. After a few navigational challenges the year before saw a few improvements to the course marking and apart from one of the young Buckley runners who I observed missing a style all seemed to get home the correct way. Despite how the race is listed all of us measured this at around 5.3 miles and around 1,100 ft of climb – a great mini fell race! Thanks to Andy Smith for some excellent pics too! What a weekend of running! 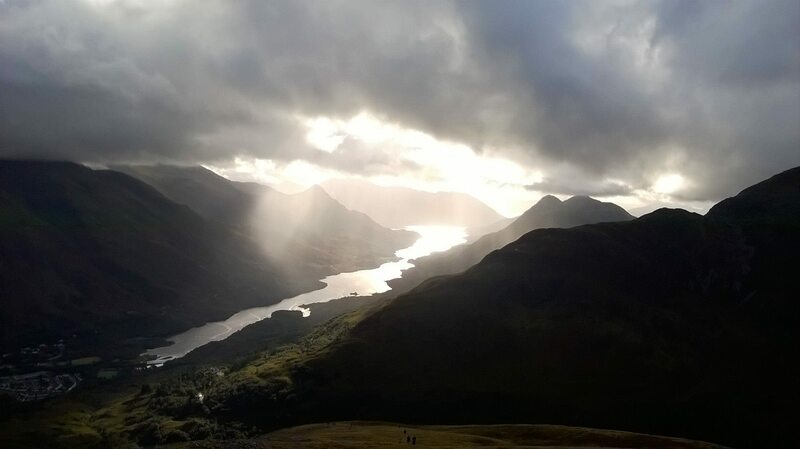 As I was helping out with the event I was up in Kinlochleven on the Friday morning to help get ready for the first vertical kilometre (1km of vertical ascent, max of 5km of distance to achieve it. Uphill only). 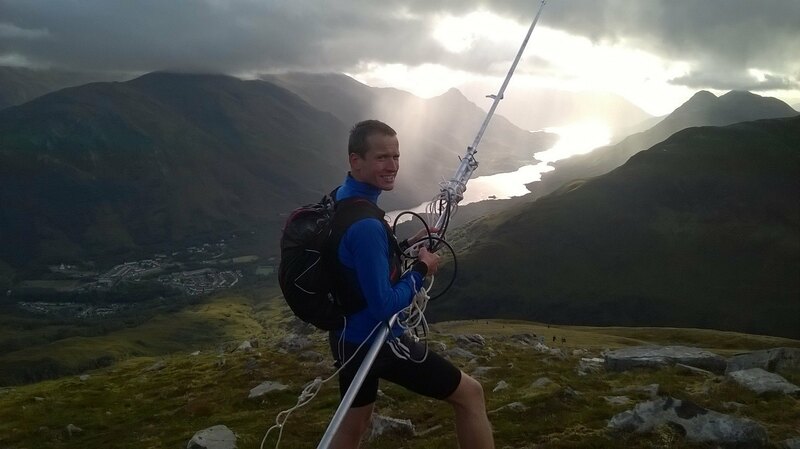 For me this meant moving a radio repeater around Munros around Na Gruagaichean, but for the competitors it meant and all out sprint to the top and was awesome to watch. I on the other hand looked like I was either going fishing or that I had the largest ever selfie stick as we’d forgotten to take the spanner to undo the mast. 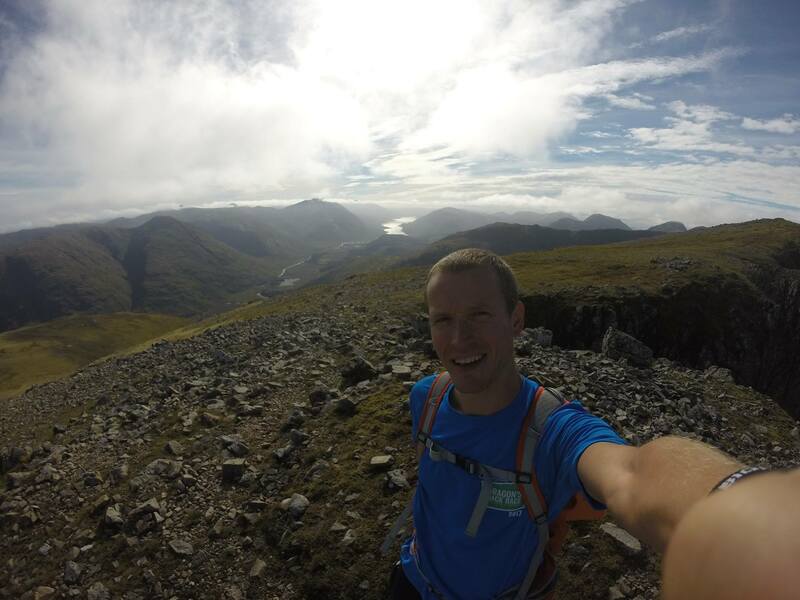 Day 2 saw the first running of the Ring of Steall (29km, 2500m) and by far the best of the weather. I on the other hand was preparing for the Glencoe Skyline by… marking the route! 7.5 hours on the mountain in glorious weather was superb on the one hand, but not great race prep! It did afford me the opportunity to see my first Brocken Spectre though which was pretty awesome. The views were utterly incredible and they just go on… forever. Really magical. The morning of the race was a rush. I was exhausted from a week of minimal sleep (away with work) and 2 hard days in the mountains. At the last minute I decided I needed to tape my heals and literally sprinted to the start line. The plan was to start slow and taper off. The first 10k was pretty standard trail running along the West Highland way, but in the light it was really special. Arriving at the climb/ scramble (the route takes in curved ridge – exposed grade 3 scramble) we hit a bit of a traffic jam which was frustrating. Faster runners don’t necessarily make faster climbers and in the interests of safety there were large sections where there was no overtaking; still we could take in the incredible views whilst they were still there. 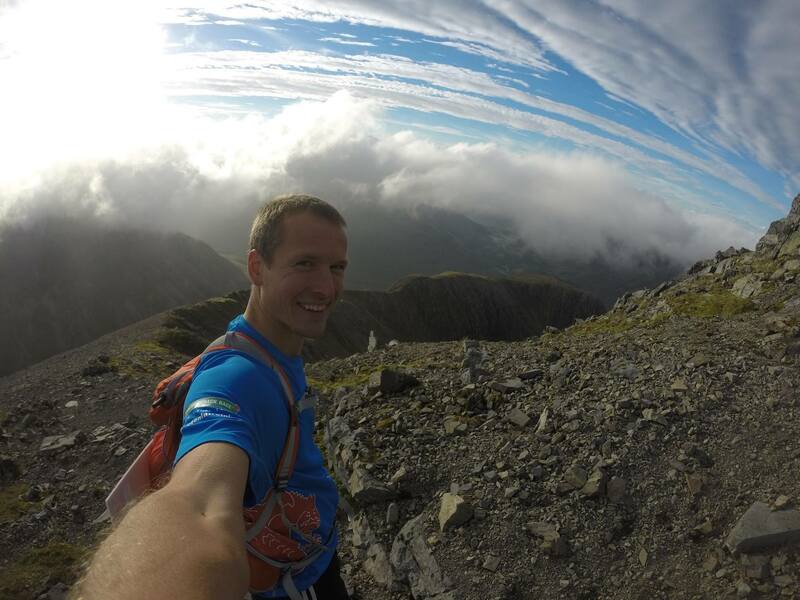 The “running” climbs were brutally steep; the mountains in Glencoe are genuinely different to the rest of the UK. Even when on a ridgeline, each peak seems to have a long descent before a sharp ascent to the summit. It’s something you rarely get in Snowdonia and certainly very rare in the lakes; it’s like everywhere is Tryfan! Taking in the section I marked was great until the mistle descended and the majority of runners reached for their windproof. Almost 30 countries were represented at the event as it was a world series race. Killian Jornet wasn’t there as he’s been looking at the speed attempt on Everest, but his sister was and I ran with her for a while… until we got to the descent where she showed without doubt that she was a skier – dropped like a stone, but in total control. The 800m straight descent to the road was brutal and I’d argue it was the most dangerous part of the course as the wet stone was treacherous. I had a plan though as I jumped straight onto the scree and surfed down. The reward for our efforts so far was a 8-900m straight climb back up so we could take on the Aonach Eagach ridge. Like curved ridge, this was a scramble (grade 2) and very exposed. The mistle and rain had made the rock wet and enabled me to move through the field a bit as some racers struggled over it. All that was left were a few marshy bumps and back onto the West Highland way for a sprint finish. The last few K’s flew by as I was dreaming of food and a shower! With a totally stacked field of world class talent it was always going to be tight at the front. Won by Jon Albion (who had played cat and mouse with Tom Owens all race) in 6:33. I, however, was nowhere near that, finishing 81st in 10:46. I went for the adventure and certainly got it. Amazing weekend. Surprisingly Just 6 green vests took to the streets of Guilden Sutton for the Sutton 6, despite this being a club points counter. This year race numbers were down anyway, possibly because of other races elsewhere. There were just 129 finishers this year, rather than the 200 (or more) plus in previous years. A bright sunny day beckoned just a tad warmer than ideal for running. This year the timing chips were on the numbers, no danger of leaving them behind! Helsby’s team of 5 gents and one lady were nevertheless up for the challenge and looking forward to racing close to home with no worries of being stuck in traffic. And with good support from the crowds for the local runners. Also for some the chance to run past their own houses! As always we were grateful for support from Mario and Joe. The course is two laps of Bellue Vue Lane, Guilden Sutton Lane and Hare Lane before heading past Chester Rugby Club along the A51 and return up Wicker Lane to the Village, where there is a slight incline to the finish line by the Village Hall. Amazingly Neil managed to knock almost a minute off his PB from last year… despite doing rather well at the King John’s Fell race the day before! Richard taking over 4m off his time last year, and Tanya who was well pleased clocking a new PB, 1m off her last years’ time and picking up a spot prize! We all enjoyed the race, Col thought it was bit harder than he was expecting, I certainly enjoyed the competition between Guilden Sutton runners, as Val Ornsby (Chester Tri) Claire Mallon, Richard Batterham (West Cheshire) and myself battled it out! I plodded the LDWA Open to Offas event on Saturday, a 30 mile circular route with over 5000ft of climb. It starts from Cilcain and climbs steadily to the north end of the ridge before following the Offas Dyke path (with a few deviations) over all of the major Clwydian hills, and includes bits of most of the local fell races. I’d been with the leading pack up to Moel Arthur, but I couldn’t keep up with them on the climbs after that. After crossing Foel Fenlli (of ‘the Druid’ race fame) the gradients ease off for a while, but by then my legs were wrecked and I was struggling. The homeward stretch has one more sting in the tail, Pothole Crags (of ‘Up the Beast’) and then flattens out for a nice run in past Loggerheads and along the Leete Path. The weather was perfect, almost too hot at times, and I got through a lot more water than I usually would on these events. As usual there were plenty of well-stocked aid stations on the route, and it was good to see Ian Hilditch manning checkpoint 6. I managed to take an hour off last year’s time, as did a chap who finished just behind me having done the same last year, and finished in 7h 39m. The inbox is a little light this week, only one report so far. If you raced over the weekend and would like it included in the blog please fire in over to helsby-race-reports@outlook.com. Rotary ClubStatic Bike Fundraiser At Tesco’s Helsby – Sept 24th 6AM to Midnight Green Army time slot is 10:00 – 11:00 – all three bikes We can also raise more by having more than one person riding in the 1/2 hour – so instead of one rider at £40, 2 riders ar £80 Or spread out the cost by having multiple riders – invite friends and family There will be a kids bike as well!!!! Tuesday 6th September was race 1 of the September multi-terrain series and race 6 of the club mini trail series. The course was at Royden Park near Thurstaston and is a lovely route taking in fields, woods and a tricky climb over a sandstone ridge. 9 out for Helsby with myself first home for the men and Vanessa first home for the ladies. Well done everyone, some excellent running and extra kudos to Boydy for turning up despite running a 200 mile ultra the previous week, the man’s a machine! A cracking race and at £1 each these are a bargain, make sure you get to the next one – 20th Sept, Harrison Drive, North Wirral Coastal Park, Wallasey. Still no results for this race but if you keep an eye on Steve Saunders website they should appear soon. Saturday saw the Northwest road relays at Delamere and what a fantastic day we had. It was a very similar course to the Delamere parkrun only with a slightly different start/finish area and 2 laps instead of 1, 6.4km in total for each stage (although we all measured it around 0.5 miles longer than this!). The best of the best turned up and it was a bit intimidating at first seeing proper “afleets” doing their warm up drills, but I think we can hold our heads high as we mixed it with the some of the best running clubs in the NW and all had a great time. Well done Green Army! Also a big thank you to Joe, Mario, Andy Smith, Sue Buck, Nicki Hamling, Colin B and Jane B for their support on the day (and Jane baked some lovely cookies to replenish those carbs!!). No reports for either of these races thus far so I can only show the results sorry. Having done the 10k myself a couple of years ago I can say it’s a fast course and very flat so there are some impressive times on display, especially as it was a hot day on Sunday. Well done all! An excellent report has been sent in by Carl Pratt who competed in the BTR “Whistle Stop Tour” last week. “I took part in the BTR whistle stop tour of Wirral. It is a challenging 3 day event covering 26 miles. Friday: Arrowe Park 5 mile trail run – 00:36:07 Saturday: Thurstaston 8 mile beach, woods and nasty hills 01:00:30 Sunday: Wirral Half Marathon: 01:35:55 Total 03:12:32. The Thurstaston race on the Saturday was very tough. A long stretch of beach followed by 2 monster hills over 8 miles. The Wirral half we had really good conditions but unfortunately I was not in the best condition after 2 days of racing. Next personal target will be a sub 1:30 at Tatton Park Half Marathon in November. Please find a link to the consolidated parkrun results from Saturday. Well done to Fitzy who smashed Widnes for a 2nd place finish and new PB! Well done to everyone else who took park. That’s all this week. Happy running folks! Firstly a Fundraiser reminder from Betty. There will be a kids bike as well!!!! Colin Thompson sent in this report from a brutal sounding Halewood 5K on Saturday. I was all on my lonesome for the Halewood 5k on Saturday but managed to put in pretty decent run in torrential conditions. The standard was very high, the top 3 all under 16 minutes, I managed to get my fastest time of the year with 17.18 in 12th place so very pleased with that one! Not so much a race report as a recommendation for next year. The Clwydian series has been running for a few years offering 5, 15 or 30 mile options in this vertically challenging part of the world. They are relatively small and low key events offering excellent value for money. The start point is the Golden Lion Inn Llangynhafal, familiar to anyone who has ran the green green grass fell race and the routes take in Penycloddiau, Offas Dyke path, Moel Arthur then Gronfoel . The 15 mile route that I did had 1145 metres of climbing over its 24k. The course was petty well marked (and a map was provided at the start) with feed points (cake, water and coke) and tag watches provided at the start allowed you to assess your splits after the race and let the organisers keep track of the runners. It was a real mix of terrain – from the typical fell running steep slopes to stone gully climbs, through to some decent farmers trails where you could pick up some speed. Some of the climbs were tough but the views at the top of Moel Arthur were amazing. For someone like myself who has taken part in a lot of the shorter fell races the 15 gave the opportunity to push on a bit further and take in the stunning scenery. I honestly can’t recommend it enough for anyone looking to push their limits. As for the race itself, well no one wanted to take the lead at the start faced with a near 300m climb in the first 3 kilometres, so after a few minutes of slow shuffling I just went for it and spent the rest of the race thinking I was being chased down. I struggled on to the end (extra km due to wrong turns) only to find that I was nearly 15 minutes ahead of the guy in second and set a new course record. Neil also took the overall 1st prize in the Deeside Multi Terrain series earlier in the week so a cracking few days running from him. Next up, 2 reports from Shelf Moor fell race. The first from Steve Riley, the second for Laura BH. Fast becoming a favourite race, Shelf Moor saw a small but perfectly formed Helsby turnout with 5 green vests toeing the line near Glossop. The local rifle club was unable to to strike fear into the heart of our brave warriors …that came a mile in when the gentle incline of the stream valley abruptly swung left to take in the brutal climb of James Thorn. Topping out at just over 2000′ the climbing was all done in pretty much one big pull. Ben was not to be seen after the start, coming home in a very respectable top 20 finish (always a stiffer standard in these Peak District races) and knocking a few mins off last year’s time. Laura and Steve swapped places for a close tussle to the end, Janet coming in soon after. Phil came in some time later with a smile on his face after some navigation practise. We ran a good mile or two in the mist and despite a well flagged route, it was easy to go off piste (note to curious fell runners – this hardly ever happens, we usually come back with the same number we set off with). Good work Phil pulling it back. Tea and cakes to finish naturally. Thanks also to CBH, James and Rhys for high quality cheering at a couple of places on the course. Sunday saw the next race in the Fell series and 5 green vests made the trip east to Old Glossop for the Shelf Moor fell race. This is a cracking race with a bit of everything. I have decided I need more practice running across bogs – was not very good at taking the racing line! No official results yet but Ben Fletcher was first home for Helsby men followed by Steve R. I finished first for the Helsby ladies (after Steve) and then Janet. Mr Gillard illustrated why they require you to carry a map and compass and was last back after a bit of a detour (it got a bit misty on the tops). Luckily unlike me he can actually use a map and compass! Great running everyone. This race was also part of the interclub competition. There were a few out for Spectrum, not sure if final results are out yet – will post them once they have been announced! Chris Bayham-Hughes’ report from the epic UTMB Trail Race including some absolutely amazing photographs. It’s done. Mission accomplished. The iconic trail race that has captured my imagination for the past 4 years (and has beaten me once) has been completed. For those that don’t know of it, UTMB is to ultra distance trail running what London is to Marathons. Starting and finishing in Chamonix competitors run 105 miles through 3 countries with over 10k of ascent (and 10k of descent). It’s a beast. I’ve just started writing a list of magic moments and I totalled over 20, they were generalised, long and spanned pages. So I realise I need to cut this down for consumption. I’ll post up a full blog with photos on my blog site: http://www.baynham-hughes.comn/Blog in due course and I’ll also continue to try to get this back on line and up to date…. My mum will want to read it at least ? Incredible personal support and thanks for all the texts! 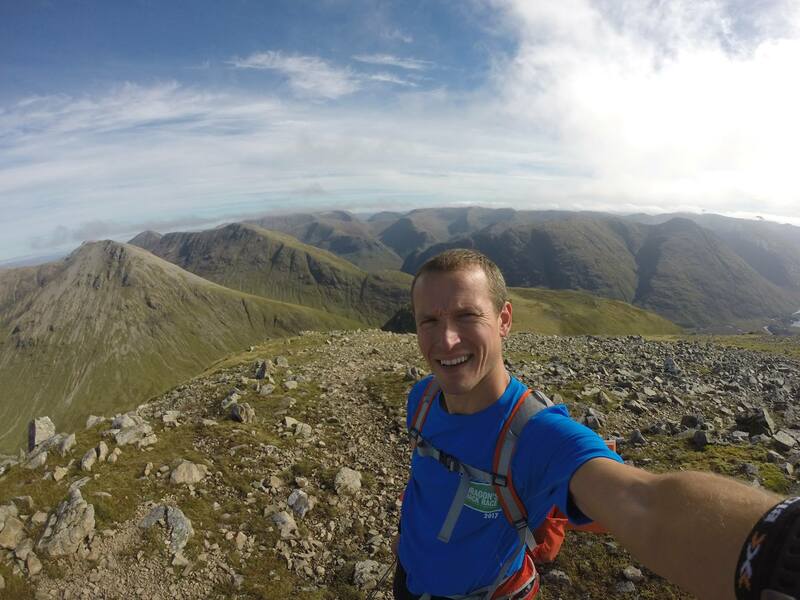 Amazing support for my fundraising – truly humbling! One thing that left a lasting impression was the thunderstorm directly over head whilst I was on the climb out of Champex. I love a storm, but being on a mountain side next to people with poles and it literally feeling like the lightening was missing us by inches was a good lesson in how quick mountain weather can change. I developed a need to get off the mountain very quickly and was keen to stay clear of anybody with poles, a large number of fillings or that was unusually tall! In the end I took just over 34 hours (I’d have broken 34 if my feet hadn’t been agony) and placed 184th out of 2300 runners (over 40% of the field dropped out). I thoroughly enjoyed it, but not sure staying 100 vertical metres was a great idea (it was as it was with friends, but it did take ~ an hour for Laura to push me up the hill as I kept losing my balance and falling backwards due to the pain in my feet). Well worth the 4+ year obsession. My own go pro footage to follow. Lastly, Fitzy has turned to the darkside and tried his hand at a triathlon. Heres his report…. Ok so it’s not a report fully focusing on running, but thought I’d let you know how I got on in my first Triathlon. 8 weeks ago I decided to take the plunge, and enter a sprint distance, 400m pool swim, 20k bike and 5k run. I know it doesn’t sound a lot but for me who could not swim very well at all, the swim part of this was always my worry, but a few lessons off my daughters swimming teacher soon sorted out my breathing technique, and 8 weeks of a few hours in the pool each week, got me to the start line raring to go, and I’m glad to say I probably enjoyed the swim more than the bike and run. There is definitely room for improvement on the swim, the bike was pretty good and I was 2nd fastest on the run, and came 9th overall which I was over the moon about. 70% of participants were first timers, so this created a really friendly atmosphere, the organisation and facilities was brilliant and the marshals were some of the best I’ve seen encouraging people all the time. For a starter event this was great value at £20. I need to now man up a bit and go for an open water Tri, although that won’t be until next spring as the winter approaches. My message to you all, if you really don’t fancy doing something like I have for years with swimming, it’s always put me off, then have a go, you might just surprise yourself and get a proper good kick out of it just like I have this weekend. Oh, and Ste Roach was there too.